Jamie Foxx came by to talk to Kelly Ripa and Michael Strahan about the new version of Annie, which I am so excited for. He’s an Academy Award winning actor and Grammy winner musician. He had an amazing entrance dancing and hugging people and clapping. He even did the robot and did the wave with Kelly & Michael. Then he played air guitar. He’s a really fun guy. It’s almost Foxx’s birthday. It’s on December 13th. He joked he’s going to read some scriptures and go to church. He talked about being a Sagittarius. He’s intellectual and generous. He’s also impatient. He just wants to get going and have fun. Kelly wanted to ask him if he was passionate. He is a passionate guy. In college, he didn’t have any money, so he went to a woman’s dorm room and sang to her. She loved it. Foxx joked she jumped down to him. He’s old school about being passionate. There are a lot of famous Sagittarius people. Michael’s a Scorpio or Sagittarius. Kelly’s a Libra and Foxx’s daughter is too. Foxx loves Christmas. He starts competing with his lights. They showed his house. It was absolutely amazing. And they start early. Kelly thought it was the White House. Foxx did his Obama impersonation. They do so much for Christmas. Robert Downey Jr. has the guy who does his lights do his lights too. He did an impersonation of him too. He said the lights cost $40,000. He couldn’t believe it. It’s just lights, so he kicked him off the property. The guy doesn’t even celebrate Christmas. So they save the lights now. Kelly called him the most talented person she’s met in her life. He did something they said never to do: work with kids and animals. Quvenzhané Wallis, who was nominated for an Oscar at age 9 for Beasts of the Southern Wild, is an old soul and really talented. She was nominated for a Golden Globe and could just learn lines on the spot. She’s not like any other kid. Jay Z also redid “It’s a Hard Knock Life.” Then, he and Will Smith got the rights to Annie. Foxx based his character on Sean Combs. He’s such a big personality, but is completely a father. So, he based it on that. Kelly & Michael’s kids loved the movie. In the clip of Annie, Annie was trying to leave Foxx’s house. She thought he was kicking her out. He wasn’t, but Sandy had to go. It was pretty adorable. Annie will be in theaters on December 19 2014. Then, Foxx did the Christmas Carol Challenge. He sat at the piano and they threw out celebrity names while he sang an impersonation of them doing a Christmas carol. He was a little concerned it was live. First he did Prince. He was struggling a little bit. Then he did Monique. Then he did Bill Clinton and Mike Tyson. Then he did President Obama. 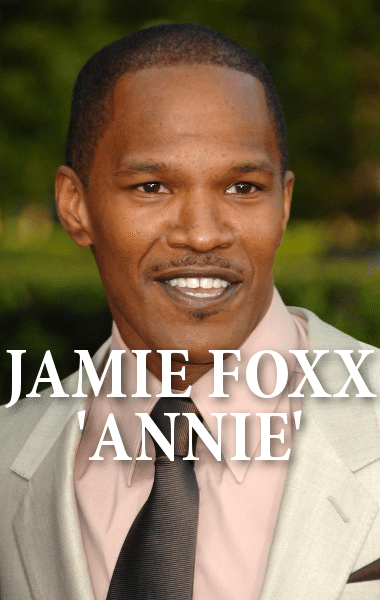 Then he did Jamie Foxx. He’s so talented. He went to school on a movie scholarship.